When I saw that NASCAR drivers were punching each other in the face with increasing frequency, only one question crossed my mind. How can I, being fat, slow, and dainty, get in on this hot NASCAR-punching action? Well now bookies are placing odds on the fights, so you can put your money where your dreams are. If someone does go after Keselowski, who is it most likely to be? Explainer: Odds are it will be someone who is still in contention but not at the very top. That means Jeff Gordon, Kevin Harvick, and Matt Kenseth are prime suspects. While Gordon may have gotten some licks in last week, he emerged visibly angry and frustrated. And we all know his history of off-track incidents. The hot-blooded superstar will not worry about sullying his reputation with another scrap. 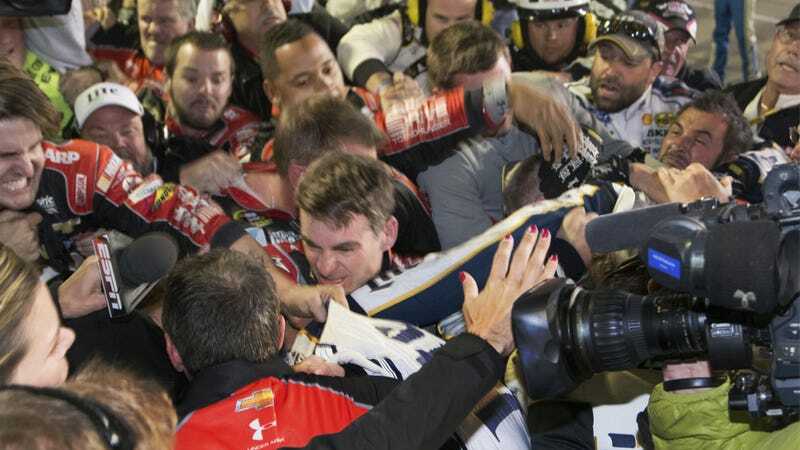 If anyone – in particular Keselowski – gets in Gordon's grill in the next two races, we expect a similar response. Kevin Harvick played instigator last week and may feel like he has something to prove. In fact, he told Keselowski he should face up to Gordon for what he did. Harvick knows that the racing public heard his words and may feel like a hypocrite if he's in an on-track incident and doesn't throw down. Also, as every news outlet has mentioned, Harvick's company manages several UFC fighters. That's got to count for something, right? Carl Edwards has stayed out of the fray, so far. But, back in 2011, everyone witnessed his volatile temper first hand back when he confronted Matt Kenseth in the middle of a television interview. No real punches were thrown in that confrontation, but there was some shoving and, apparently, a fake punch from Edwards. He's currently sixth in the Chase standings and, if Keselowski (or anyone else) does something to keep him out of the top four heading into Homestead, we would not be surprised to see Cousin Carl go off. Odds on a fight happening in general at the next race is 5/1, and that honestly makes me a little sad. But only because I wish it was more likely. NASCAR hasn't been this exciting since someone slapped Max Papis and he countered with the sneer of death.